Expandable Fully Hydraulic Wings- Expand your plowing potential when you get to parking lots and wide open spaces by extending the wings of the EXT. At the touch of a button, the 8-foot blade expands to 10 feet, quickly and efficiently. The expandable wings are set at a 20-degree angle to contain and capture the snow allowing you to move it where you want it. Fixed Forward Wings- The EXT was used by BOSS Owners across the country for testing. The EXT proved to effectively windrow. The pitched forward wings and blade design allow the blade to take even more aggressive cuts when windrowing than a typical straight blade. Chainless lift system- The EXT features a chainless lift system with high-performance hydraulics system— making it fast, responsive and free- from bounce during transport. Simple Design- The EXT was designed to carry as much snow as possible on every pass – improving productivity. It was designed with the simplicity and ingenuity that you expect from BOSS. The EXT design has fewer moving parts when compared to some other expandable plows making it easy to perform routine maintenance. Another benefit of this design is the accessibility of the hydraulic cylinders and hoses on each of the wings. In plowing, things happen. And when you have to get something fixed, and fixed fast, you need access. With the BOSS design, there are no covers or housings to remove decreasing your downtime. Standard RT3 Undercarriage-The EXT uses the BOSS standard RT3 undercarriage which allows you to quickly and easily swap the EXT between any truck in your fleet— from EXT to DXT, to Straight. SL3 L.E.D. Headlight System-The EXT comes equipped with the SL3 L.E.D. Headlight system with up to 2x the light output compared to traditional halogen lights. With a life expectancy of 8-10 years, this system eliminates the frustration of frequently changing light bulbs. The BOSS’ exclusive Ice Shield technology prevents ice buildup utilizing a thermally-conductive grid to actively heat the SL3 lens. Full Trip Design- The EXT utilizes a full trip moldboard similar to a BOSS Super Duty Straight Blade. It went through extensive testing to protect the truck and plow from damage when obstacles are encountered. Urethane Edges- The EXT wings feature urethane edges for maximized performance. Urethane’s material composition is a type of durable, heavy duty, flexible plastic. The nature of the urethane material allows it to mold to the ground surface. Because of this, it creates a squeegee effect and performance is maximized when plowing fresh snow or slushy conditions. Curb Guards- Curb guards wrap around the outer edge of the cutting edge to protect it from damage that could occur from scraping against a curb. Curb guards come standard with the EXT to protect the cutting edge and plow from damage. Blade Leveling Adjustment- The EXT has a blade leveling feature to accommodate variations of push beam height allowing you to level the plow when you mount it to increase efficiency. With the wings on the EXT sitting forward at a 20-degree angle, you need the ability to adjust the angle of the moldboard to ensure that the cutting edge is scraping along the entire bottom of the blade. We make this easy to do with our adjustable Cam Stops.There are four of these Cam Stops located on the backside of the main blade, and by turning these cams, you can adjust the angle of the moldboard forwards or backward. By doing this you are leveling the cutting edge and improving scraping performance. 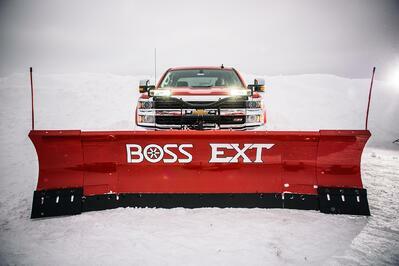 The power of the BOSS EXT is all about the added efficiency when plowing parking lots and wide open spaces. The EXT gives you the edge to restore order when winter rolls into town in a big way. 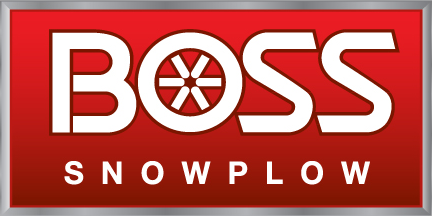 Expand your plowing potential by adding the BOSS EXT to your snowplow lineup. Watch the video below for a breakdown of EXT features.